Santa Fe Property Management is led by Luke Cordova, who started the company in 2010. Luke has had his broker’s license since 2006, and saw an opportunity to not only sell real estate in the region, but to manage the properties of other investment property owners. He also saw how his experience could help turn renters into homeowners through his relationship with Keller Williams. Today, Luke and Santa Fe Property Management boasts a roster of single family homes, condos, multiplex properties, and multiple vacation rentals. He manages these properties with integrity towards both his tenant/guest customers and his investment property owner clients. The homes Luke offers as vacation rentals have been carefully chosen. These homes have wowed the guests that have had the opportunity to stay in them! Santa Fe Property Management prides themselves on the responses from guests. Most importantly, Santa Fe Property Management is always striving to exceed its guests expectations! We have contracted a professional linen service that provide Luxury Hotel quality linens. They are comfortable! In addition, we also provide body towels, hand towels, wash cloths, shampoo, conditioner, body wash, hand soap, dish soap, dishwasher tablets, toilet paper, and paper towels in all their properties. We even provide an assortment of snacks upon their guests arrival! 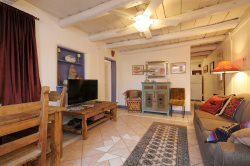 If you are considering a stay in Santa Fe, you will definitely want to book with Santa Fe Property Management. No one else comes close when it comes to the experience you’ll get with Santa Fe Property Management & Vacation Rentals!